Hair of the Dog is less than two miles from my house, but somehow I never make it over to their Earth Day open house events, despite years of good intentions. I didn't even make it to FredFest there a couple weeks ago. 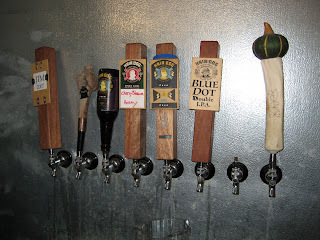 But as luck would have it, Carla and I got in on a pizza-and-beer night at Hair of the Dog last Saturday. It was a benefit for our daughter's school -- also attended by owner Alan Sprints' kids -- that our friends David and Beverly were alert enough and thoughtful enough to reserve us a place at. Any one of these would put a smile on your face. All of them flowing freely made for a very enjoyable evening. Fred from the Wood was the definite standout. Everyday Fred is already a delicious, strong Belgian-y ale. The barrel-aged Fred just turned it up another notch -- smoother, stronger, with more different flavors swirling around. It was startlingly foamy coming out of the tap, filling most of a small beer flute with head, but the head quickly -- in seconds -- turned into delicious nectar. I was glad to see that there were still some bottles of FftW for sale, $7/bottle or $140/case. There was a bit of mirth as we stood near a pallet of Fred from the Wood cases, and the less beer-fanatical members of our party guessed what a case would sell for: $25? $50? Hmm... $75? The Doggie Claws made with cherry-blossom honey was another nice surprise, the holiday-season barleywine with extra honey/cherry sweetness. And Alan sampled out a Flemish Brown ale that's so new it hasn't been named yet. A little bit of those sour beers goes a long way with me, but if that's your cup of tea, this is one to keep an eye on: it was crisp and clean, not menacingly sour like some of them are. 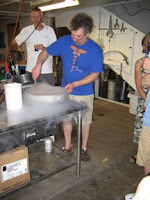 For dessert, Alan did his science fair trick of making fast-frozen ice cream with liquid nitrogen. Not the Fred sherbet described recently by John Foyston -- it was chocolate raspberry with a little Adam for flavor. Dramatic, delicious, and a real time-saver. This gathering was my chance to ask Alan about the variations I sometimes see in the Greg on tap at Higgins. He expressed surprise, saying that in his experience of keeping a keg on tap at the brewery, that it changed very little over time, and that he thought the batches were pretty consistent. He did say that he used a lighter malt this year than last, and indeed the Greg at the brewery was lighter in color and body than most of the pints I've had at Higgins. It was a great evening; I'm glad I finally made the pilgrimage. Thanks to Alan and Eliana for putting on the event and supporting our beleaguered public schools!